All passengers are required to wear seatbelts. • All wheelchairs and passengers must be properly secured at all times. Passengers that are not properly secured will not be transported. • Unsafe, discourteous or destructive behavior will not be tolerated and could result in immediate expulsion from the vehicle. • Passengers 15 years and under must travel with an accompanying adult. • All children must be secured by a seat belt prior to the vehicle moving and are to remain seated for the duration of the trip or bus ride. • Child safety seats for infants must be provided by the accompanying adult passenger. • Child’s safety is the responsibility of the accompanying adult. • It is CART”s policy to require children to be removed from carriage or stroller for the duration of the trip. • Strollers, carriages and empty carts must be collapsed before boarding the bus. • Strollers, carriages and carts must be placed between seats and remain out of the bus aisle. • Passengers must be able to manage their own shopping bags as the driver is not allowed to assist with passengers’ baggage. • Shopping bags and parcels must be stowed under the seat, on the floor in front of the seated passenger or on passenger’s lap. • Shopping bags and parcels must remain out of the bus aisle and cannot take up a seat if the seat is needed for a passenger. • For the comfort of other passengers, please refrain from cell phone use and playing loud radios while on the bus. Eating, Drinking and Open Containers of Food. 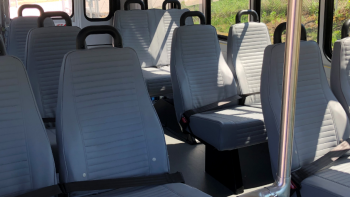 • For the safety and comfort of others on the bus, passengers are asked to refrain from eating, drinking on the bus and carrying open containers of food and drink. • For the safety of other passengers and the driver, smoking is strictly forbidden while on the bus. • Tipping the driver is not permitted. • No shows are disruptive to timely service when a CART vehicle arrives at a scheduled pick up, and the rider is not ready or does not take the trip. 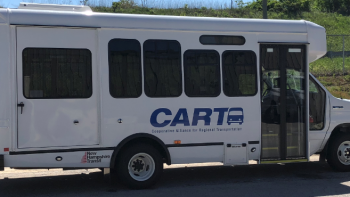 • When a passenger fails to provide at least 24-hour notice of a cancellation, it not only disrupts service, but may prevent CART from being able to accommodate another customer’s request in as timely a manner as possible. 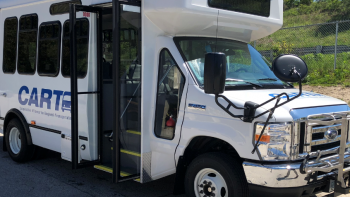 • Service is disrupted when a passenger gives the call center an incorrect pickup or drop off address or fails to give notice of a change in address.